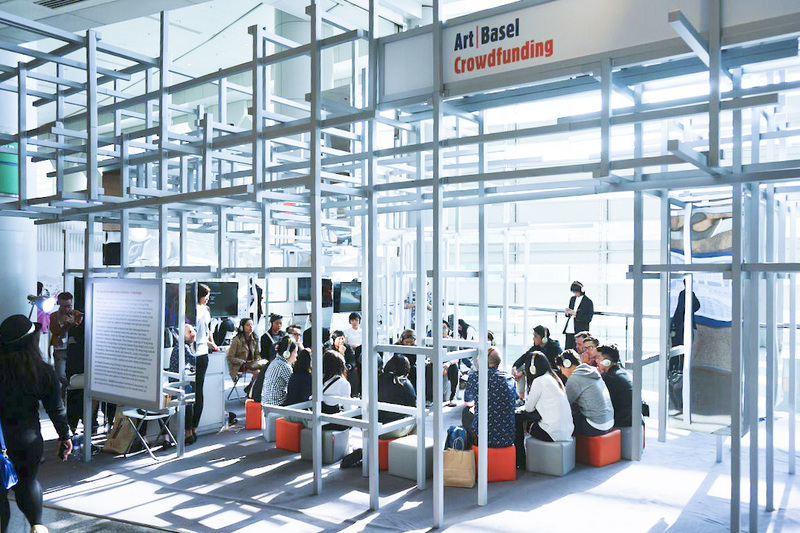 During Art Basel Hong Kong, China Residencies spoke with Isaac Leung, chairperson of Videotage, at their “The Crowdfunding Lab” showcase. China Residencies: Let’s start off with the basics. Tell us about yourself and how you got here. Isaac Leung: Long story! Well, I wear multiple hats. I’m an artist and actually had my show open at Connecting Spaces. CR: Oh I saw that, congratulations! IL: Thanks! So yeah I’m trained as an artist. I studied video and media arts at the Art Institute of Chicago, and then I came back to Hong Kong and started to wear the other hat of a curator. I’m currently the chairman of Videotage, one of the most historically significant nonprofit arts organizations in Hong Kong. We’re celebrating its 30th anniversary! Another hat is as a researcher: I spend most of my time teaching and researching. So we’re here at the booth presented by Art Basel Crowdfunding Initiative and Videotage. We just launched our Kickstarter program which is called Strangers in a Strange Place, where we want to do crowdfunding for an artist in residency program with MOMENTUM (Berlin) to bring a Hong Kong artist and a German artist from Berlin together to engage with refugees and new immigrants, and then create new work. IL: At the booth we’re showing four local art students’ work that were selected by notable professors who each curated two outstanding works made by their students. But one of the main things I’m currently working on at this booth is building a European network. We have many different partners, like the Centre for Contemporary Chinese Art in Manchester, Casa Artia from Spain, and videoclub from the UK, Zurich University of the Arts Connecting Spaces, Phantom from Berlin. This is a showcase of our strategic partners. We want to build a sustainable network that could have a long term collaboration with different institutions and countries. One of the ideas is aside from doing artist exchanges, to also test the art model. That’s also why we are doing the Kickstarter program; artists are increasingly mediated by the gallery system and the art market. Which is great but the work that is produced is subject to this kind of mediation and the art market system is getting more sophisticated to a point where all artists need to go through the same kind of hoops: a gallery to represent them, to make a certain kind of artwork in order to entertain the taste of a certain group of people. Non profit organizations also get their resources from patrons or from the government and I think the struggle with the bureaucracy is the same in both cases. The programs you produce as a non profit are very much framed by these struggles. That’s why I’m very interested in the model, can we imagine any other model that’s different from these which are adapted from possibly as far back as from the 19th century? The art scene is probably the worst one in this sense. In all the other sectors, where a lot of innovation is changing people’s everyday lives, companies like Uber and Airbnb really know how to harness the individual’s power: there’s services where you can basically rent yourself out. I was thinking, can we have a platform of artists renting themselves out to teach kids painting for 3 hours? It’s all about democratizing the individual’s power to vote, and crowdfunding makes it so that even before a show is curated, people can already vote, and the metric of success isn’t the audience number or the amount of publicity. From the beginning it is mediated by the crowd, by the internet. They’re only giving you a dollar because they really think your project is meaningful. CR: We started the same way, we crowdfunded our launch. We thought, we have this idea, we want to do it, are there enough people who care to send us on this first research trip, and 500 people basically showed their support by giving us a little bit of their money and let us know that they would use our website. It’s the best proof of concept you can have. IL: Yeah, exactly. With the crowdfunding, we really want to use projects to experiment and create new models. For example, the Both Sides Now UK project started up with only 40,000HKD and we did 10 full residency programs, 3 exhibitions, and more than 10 screenings last year between the UK and Hong Kong. So this is the idea of a “sharing economy”, if we only have 40,000HKD with 10 partners, can we create an international project that is circulated in so many different places with many audience groups, communities, and create an impactful project. CR: That’s so cool. Last year we held a roundtable discussion with some other residency directors, it became pretty obvious that everyone’s having the same problems with funding, programming, etcetera. So before this, how was the residency run? IL: We’re on our third year now, and the way we work is actually very different from the normal practice. Traditionally for a nonprofit art space in Hong Kong, you plan the international program two years ahead. You write the proposal making and requesting lots of money, and you already kind of know what you’ll be realized. But we’re very different in that from day one we knew we wouldn’t have the budget. That’s why we preferred using that 40,000HKD to bring people to the space, to give them the opportunity to experience and meet people, and develop a feeling for the space and project. We wanted friendships to form. We felt that small details like dinners, drinks, talks, or screenings, would bring in new potentials. I think that’s the spirit of a startup too. CR: But there was another residency program before right, like the FUSE program? And right now you’re working with K11 in Wuhan. Do you see all these partnerships as part of the same residency, or is each one a new project? IL: They’re different. We have a 10 year history, and for our annual program, FUSE, we maintain the same format: one international artist and one local artist who come to Hong Kong and eventually present the artwork they’ve made at our space. For the ones you spoke about, they have different aims. For example the UK project, which we worked with K11 Art Foundation on, is framed by the location. The experience is very different because the UK artist would go to Wuhan in Mainland China first, and then come to Hong Kong. CR: That’s wonderful. It’s great to see this kind of collaboration, and I’m interested to see what’s possible in terms of collaboration between Mainland China and Hong Kong. Is that something Videotage wants to pursue? IL: We don’t have a program that’s only between Mainland China and Hong Kong, we need that! This particular program is interesting because it highlights the historical connection between the UK, Hong Kong, and China. This is very important for Hong Kong. IL: Yes and so I think this program addresses that directly, whereas FUSE is different. I think we’d like to keep them different. Also, we’re expanding different kinds of projects at residency programs. Probably in the future, we’ll have our partner in Spain. Right now the programming focus in the partnership with Berlin is very interesting because of the unique position each of our respective locations have in our countries: both tiny but dynamic cities that were surrounded by Communism in the past, and that now have a heavy flow of immigration in and out. We really want the Berlin artist to engage with the local community around that topic. CR: How do you see the residency connecting to the space, the collection, and the whole ecosystem? IL: I tend not to think of all the projects as separate, which is something that professional curators do. I believe in the generative power of residencies to produce new work, especially for new media art. This work eventually becomes a collection and takes on a viral quality when it gets sent and shared to other places. I think they are equally important and mutually beneficial. CR: In terms of the residencies physically, are they in the Cattle Depot? Do the artists stay near the space? IL: Unfortunately the rent in Hong Kong is so expensive and so for the international artists, we’ve only been able to support them through collaborating with third party institutions who offer the artists accommodations. So in this sense, we have less of a traditional residency where the artists live/work at the studio. Instead we are providing cultural mediation for them, and giving them resources to engage with the local art scene and community. That’s also kind of the nature of media art- everything’s done on the computer and so they don’t need these huge studios. CR: On that note, how do you define media art? IL: For me it’s more about the mental framework around media art, and not really about how technologically advanced the artwork is. I said this in my TimeOut interview, it’s so difficult to curate new media shows because people have many expectations and preconceptions about what media art is. The technology has to fit the concept, it’s really not about how slick or interactive the work is, or how flashy the LEDs are. CR: Why do you feel like it’s a great time to come to Hong Kong right now as an artist? IL: Hong Kong is just interesting, it’s such a tiny island that has a lot of cultural and historical significance for China and the global context as well. It’s a city full of traders, of mediators, who have always been able to speak many languages and tell many stories. That’s the flexible, dynamic nature of the Hong Kong spirit that can mediate between the East and the West. As for the art scene, I think we need to have more rigour and push towards becoming a leader of culture. For that to happen I think our ecology has to be expanded because it’s still very narrow. CR: Last year there were just five residencies in Hong Kong and this year there are at least nine, so even just the speed of that development has been amazing. You’re all doing such important work filling in the gaps. IL: The audience is also so important. No curators or art institutions could survive without a quality audience. We could do shows that extract millions by showing things from popular mainstream media, but ultimately we won’t find meaning in that. We need to dramatically lift the standards of the audience, or even create a discourse, or space for debate. This interview was conducted on March 24 2016 in Hong Kong by Kira Simon-Kennedy for China Residencies.